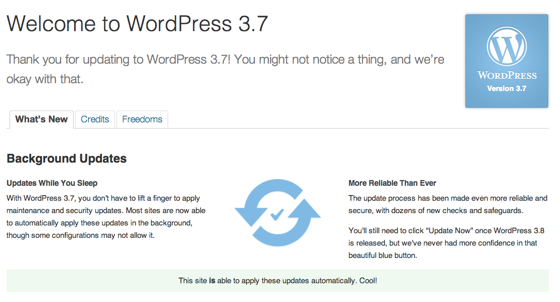 Wordpress has been upgraded to version 3.7 and I saw notification of this in my Wordpress Dashboard today. As usual, this is for users who host their own, local, copies of Wordpress. If you you use Wordpress.com, your blogs will be updated automatically. Automatic updates for maintenance and security updates. Daily updates for developers using nightly builds. New password meter to encourage users to choose stronger passwords. Localized versions will receive faster and more complete translations. For a complete list of the extensive updates, view this page at the Wordpress Codex, Wordpress Version 3.7. Upgrade your locally hosted Wordpress sites today!